The Chemistry of Cationic Polymerization covers the fundamental aspects of organic chemistry that provide significant insights into the many facets of cationic polymerization processes and products. Each chapter deals with individual and groups of monomers. Considerable chapters examine the chemistry of oxygen compounds. 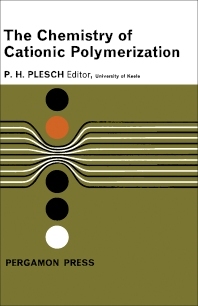 Other chapters describe the techniques for cationic polymer analysis and detection. This text also considers sulfur compounds, particularly their polymerizations by radical and anionic mechanisms. The remaining chapters explore the polymerization and products of carbonium ions, related organic reactions and comparison with radical and anionic polymerizations, as well as the conspectus of kinetics and mechanism. This book is of great value to organic and polymer chemists.